There comes a time when innocence is shattered by loss and sorrow reigns over the land of the heart. It is said that what makes our species so special is our awareness of our own mortality, and of those whom we love. It is what makes us beautiful, it is why we find beauty in the world. It is how we create our own beauty. And it is why the gods are envious of us. There is a lake near the house I grew up in. It is in the middle of the city. On all the hot summer days, my friends and I would walk down to the lake, cross the busy city traffic and through the park, shedding our sweaty street clothes and jumping into its cold embrace. It is a small lake, and algae would bloom during those solstice days, making it fit for its name: Greenlake. That lake raised us. Me and sisters. And my Brother. But now it has taken one of our lives. The individual experience of such a loss does not bring forth immediate clarity and understanding. Thoughts become confusing and unreliable. Fuzzy. Dizzying. I now exist not only in the world of the living. I sense the cold kiss of death closer than ever before. Its seduction looms just beyond my sight, and I turn eagerly to catch a glance, but always missing it. If there is such an existence beyond what we call life, then my beloved brother is now embedded within it, trying to find his way back to our ancestors. Through my creation and past images of him, I have attempted to immerse my imagination into this realm beyond existence where I can only merely believe he now treads upon. I will not cease to illuminate your existence until I too have embarked on to The Great Journey. In 2014, at the age of 16, my younger brother came to visit me in Hawai’i. He was in high school. Young, but growing up quickly, he was confronting his own individuality and the boundaries of his own morality. His spring break visit came at a time when my mother and step-father were worried about his developing deviant behavior and lack of care for school. We traveled the island together in my beat-up ’96 Subaru Outback for 5 days, before I had to get back to work, and he to school. While rummaging through my digital archives, I stumbled across the few but memorable photos I had taken from that trip. 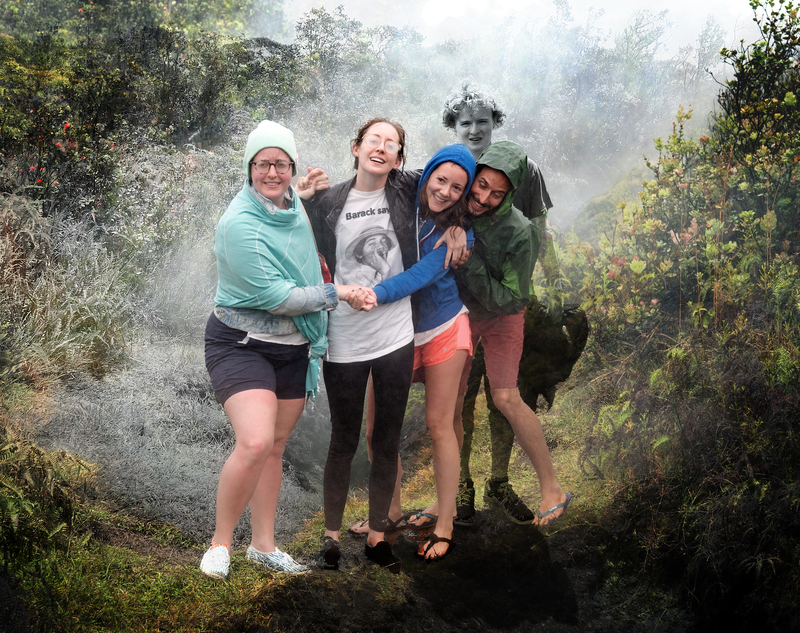 When I came across the photo of my brother standing alone amidst the steam vents of the Kilauea Caldera, shivers shot through my spine. The solitary stance of my brother squinting into the lens of the camera made me break down and cry almost instantly. It wasn’t so much because of this particular photo alone, but because I knew there existed a photo of me and my three older sisters standing in the very same spot only two years later. The two images in my mind so starkly represented this distance and space now between him and my siblings. It was haunting. I needed to rectify it, if not because of this guilt and shame I felt deep down inside that my brother was always on the fringe of our sibling dynamics – both in age and in personality – then because of surrendering to the grief that must accompany those who remain alive to mourn the dead. I merged the two photos together. The feelings began to pour through me; Guilt, anger, sadness, grief. At first, I attempted to make the images one layer, so to speak, to join Taiga’s image alongside his siblings, as if he was there with us the whole time. I was following that guilty feeling that made me want to rectify the separation of us and him. But when I combined them like so, the image did not feel authentic. It did not feel true. Instead, it felt like a cover-up. A way to deny the truth that he is no longer right there with us, just like he was not there with us on that trip to Hawai’i. He came on his own. I decided I needed to confront the darker realization. That he was now a ghost – logged memories in our minds, past murmurs reverberating in our hearts. He was not beside us – next to us – but instead a subtle force behind us. Someone we could sense, and maybe if we turned around quickly enough, might catch a glimmer as his image fades into the haze. If we do not mourn the dead, then they will come back to haunt us. This is the first step in the Great Journey of the Spirit. It is our responsibility as the living to reconcile with who we have lost – the wind in which the sails of the spirit’s vessel first catches on the journey across the cosmos. Finishing the first image left me with a greater hunger to create; to pour all my focus and attention into my brother. I had laid down the groundwork, which became the germination for this forested desire, and was now ready to see which direction this would go. I could not quite yet see where it would take me, but knew it was taking me somewhere. I don’t have a lot of photos of my brother, mainly only from his trip in 2014. I decided I would just stick with these photos. Maybe that was what this project was – a way for me to connect with my brother personally. Maybe that’s what these images represent: a trip he took solely to spend time with me. So it began as most things do, as an inner and selfish desire. This was about me just as much as it was about Taiga. Maybe only about me. The next image I came across was a landscape shot of Mauna Kea from a Pu’u that stands between the Giant Volcano and its neighbor: Mauna Loa. I took the photo as Taiga was walking just below in the distance but in the foreground of the massive mountain that towers above all life on this island. I liked this image if only for the sake of the perspectives and composition: A faraway volcano draped in silhouette and clouds. A tiny thin-lined road with a pilgrimage of mini cars ascending to its peak. My brother walking stiffly in the cold in tandem with the road. It made for this connection between objects that otherwise seemed so far away from one another. But when I looked at this image again, I felt a loneliness protruding from my brother. I imagined him now wandering across the vast landscapes of this earth, surrounded by life but no longer a part of it, only moving through it, past it, fading out of existence and into nothingness. The closer he tried to move towards something he knew, he once was a part of, he would come to find that his own tangibility would dissolve. With this image comes the next phase of the great journey: wandering along the planes of Earth. The recently dead or released spirits have accepted their severance from the living, but have not yet accepted their severance from home; Earth. And so they wander, denying the call to a greater cosmic universe that awaits them. Perhaps this is what my brother is doing now, visiting the places he never got to, holding on as tight as he can to the only world he knows, yet slowly losing his grasp – slipping away. One of the last things I remember my brother telling me was how much he hated school but loved to learn. I think perhaps those words more than any other have given me the courage and purpose to become a teacher. A month after he died, I found myself back in Hawai’i as an English high school teacher. The other day one of my student’s shared a metaphor for how her mind works. I contemplated her answer and realized then what drew me to create this next image of my brother. The intertidal zone is a harsh place to call home. It is turbulent as it must constantly face dealings with change; desiccation, salinity, wave turbulence. It is the shore, the threshold, the gateway between two worlds. I imagine my brother making it to the shore after wandering aimlessly as a lost spirit on Earth. I imagine him splitting from the memories he has attached all of his existence to, and severed from. I imagine his own notion of himself shrinking and dissolving into the rocky shore, becoming detritus for the invertebrates to consume, breakdown, and assimilate back into the earth. I imagine the pain of all this. The grief he must feel to no longer have a life. We, the living, mourn what we have lost, but what of the Dead? For they have lost their life. How do the dead mourn? The sun, bringer and destroyer of life, rises between the dividing and splitting of his existence, severing my brother once and for all from any more ties to this earthly plane. It is time to never look back. When we confront the aspects of ourselves that no longer serve us, and only after shedding the dry skin, are we ready to face the chapters in life that beckon us forth. Perhaps the end of life is only the shedding of our physical burden to be released into a greater chapter of existence. The excitement that builds as we sense our preparedness is ready to bloom into action is a feeling that excites and awakens every molecule in our being. For the dead, what exists that can feel, if anything? I await the moment I sense my brother has discovered his liberation into the vast unknown, the uncharted territories that we mere mortals have only seen through the eyes of our instruments. 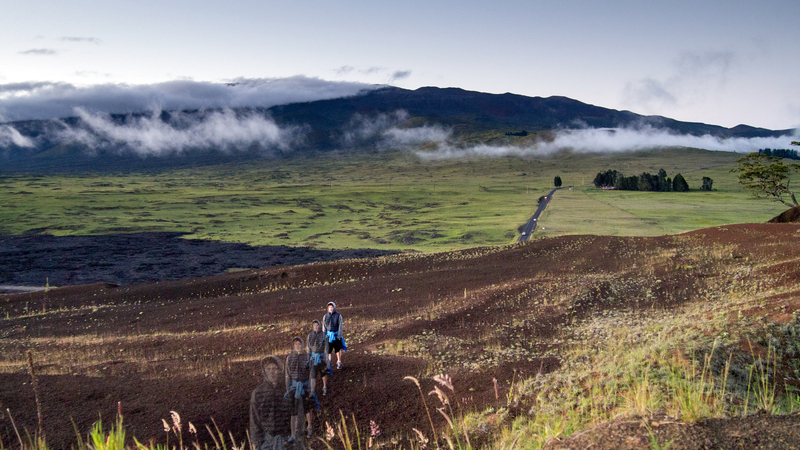 This is a photo of my brother peering down into the crater of Mauna Ulu, which can be translated to mean Mountain of Growth. It was a crater that was active in the 80’s, but now rests in its dormancy. The position of my brother leaning ever so slightly down towards the depth of creation, while still holding on to the earthen rock, made me think of that moment we discover just how deep the rabbit hole goes. This moment of release is the moment I pray my brother has found or will find. For he is most certainly meant to be amongst the stars. 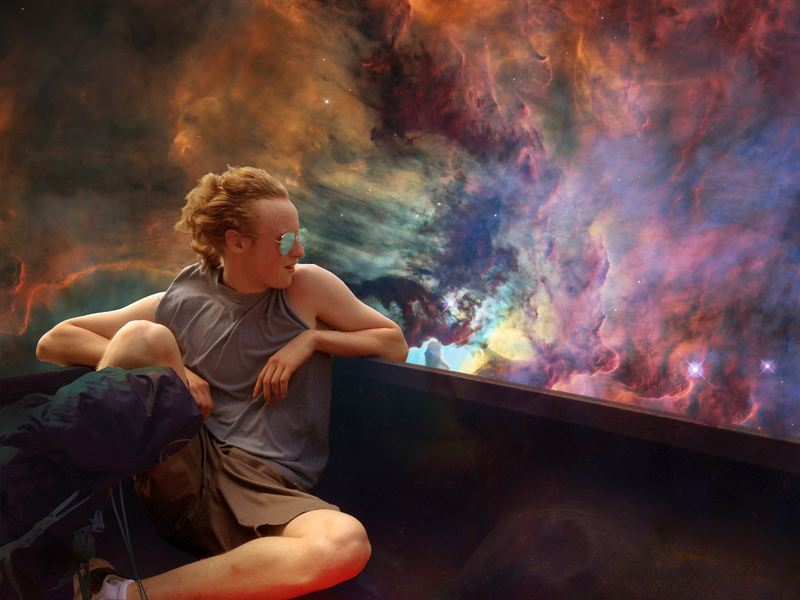 The cosmic wind in his hair, hitchhiking across the Lagoon Nebula, my brother is at last now on his way towards the infinite. 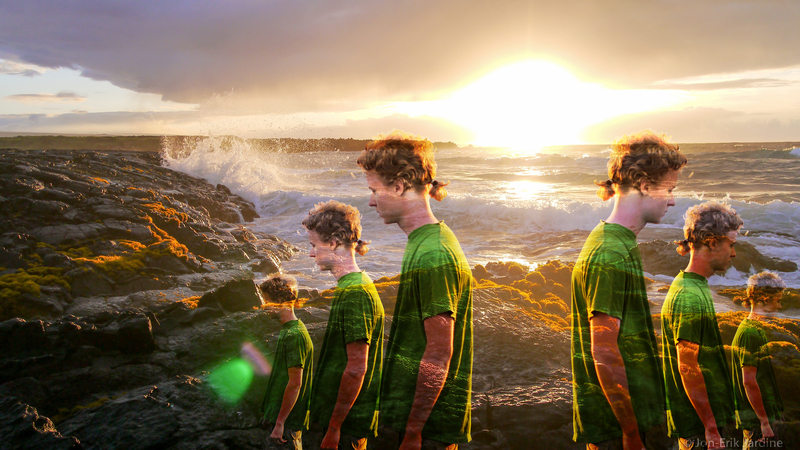 From yet another photo of my brother’s visit to Hawai’i, I captured him during a moment that I like to think forever impacted him. It brings me great joy to think of the two of us riding in the back of my friend’s truck, out towards the beach, and to also picture him now rocketing through the heavens, exhilarated by this newly found freedom. With such a perspective one can only celebrate his early departure from this Earth. The background image of the Lagoon Nebula was taken by the Hubble Space Telescope and released on my birthday this year to celebrate the 28th anniversary of its launch. Yes, I and the HST are indeed the same age, and it seemed only fitting to use its glorious images to depict my brother free at last. 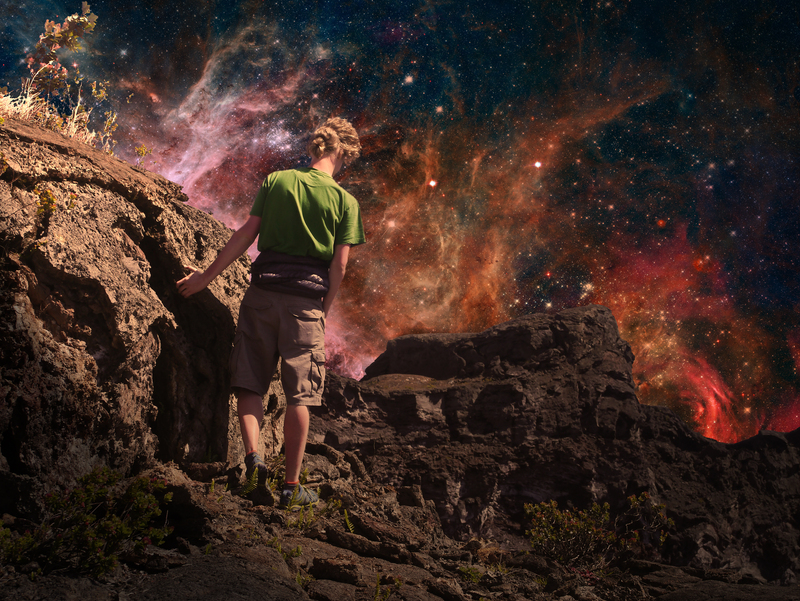 After traveling across the stars, galaxies, and universe, my brother has become a cosmic cartographer. His death was twisted. He died doing what gave him peace in what otherwise seemed like a tumultuous time in his life. He loved to kayak on that lake. It’s what got him up in the morning. He even worked at the lake, renting boats out to the park goers. 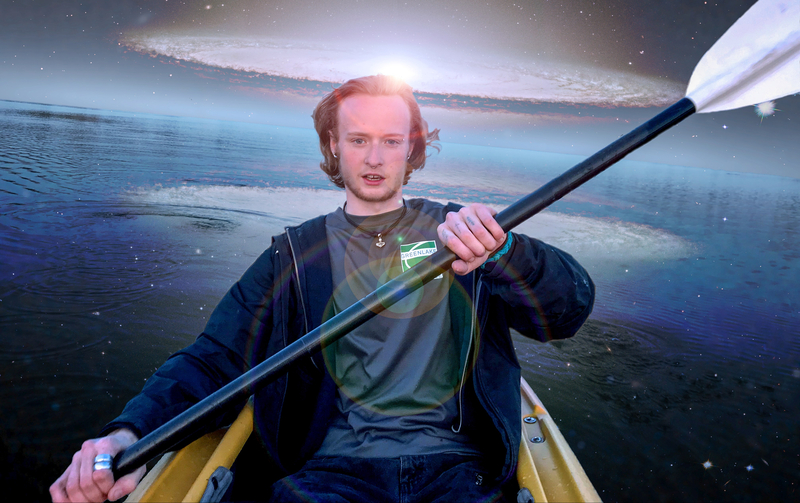 It seemed only right to use a photo of him paddling on the very lake that took his life to show him mastering the heavens. I will only miss you here on this earth for a brief moment, for life is short. And in this brief moment that remains of my own life, I have eternity to look forward to spending with you. You will have much to teach me when that time comes.